Enhanced Move Formatting options - since Move Formatting on Operations may affect performance on zoom operations, this Oracle Smart View for Office formatting option is now always disabled by default. You can read more about these features in the SV 11.1.2.5.800 readme file. 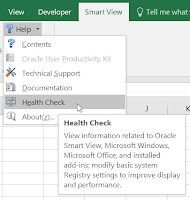 Health Check is a handy new tool that has been added to the SV Help menu. 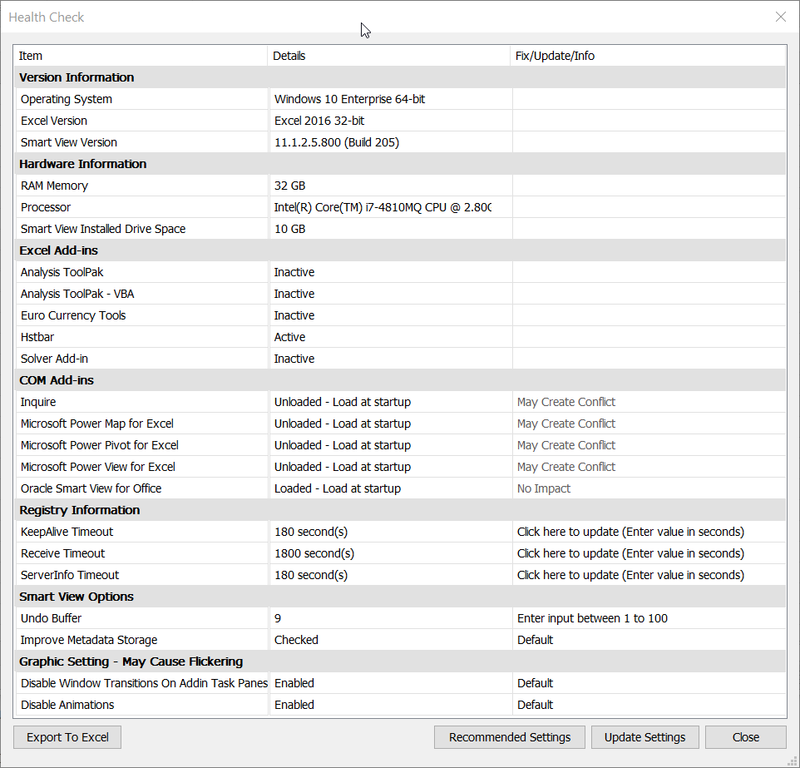 The tool displays version details for the operating system, Excel and Smart View and also shows the most important settings affecting SV performance and stability. There is a button you can click to set recommended settings on the user profile level. 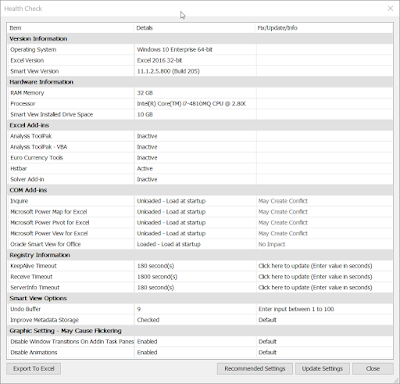 This is nice functionality for troubleshooting refresh issues that are often caused by timeout settings not being tuned properly in Windows registry. Firefox ESR 60 and later require all add-ons to be created in the new WebExtension format (as mentioned in my previous post). 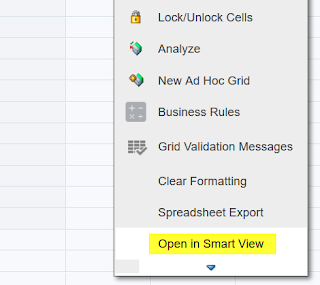 Oracle has now updated the Firefox extension that is used by the “Open in Smart View” links in EPM/Hyperion web forms (only Firefox needs this extension - Internet Explorer opens the links in a different way). It's worth noting that the extension is no more distributed with the Smart View package like it used to be and therefore all Firefox users need to install it separately from the Mozilla Add-ons website. It is also possible to automate the installation using alternative distribution options. Mozilla has just released a new version of their browser: Firefox 57 “Quantum”. The new release is promised to be even faster than before, but there is one downside as well; it disables extensions that haven’t been implemented with the new WebExtensions technology. 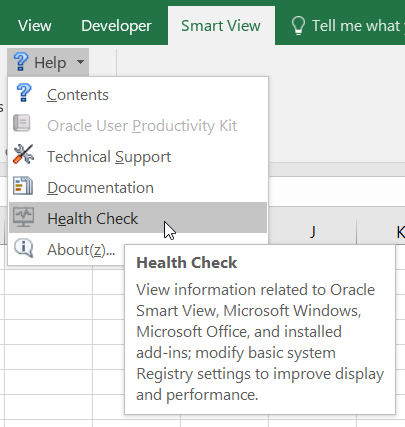 The extension installed by Oracle Smart View is among the "legacy" extensions that can't be used with the latest Firefox version. This means that the "Open in Smart View" links in HFM, Planning, PBCS and FCCS will cease to work in latest Firefox because they rely on the old extension. 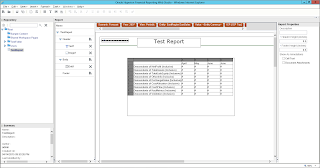 Oracle has published the following statement in the latest Smart View readme file and also in the monthly notes for the EPM Cloud Services. Future releases of Mozilla Firefox will be phasing out support for XUL-based add-ons such as Smart View. Starting in mid-November 2017, only add-ons and extensions built with new web extension technology will work in Firefox. Therefore, Smart View 11.1.2.5.710 only supports Firefox versions up to ESR 52.4.1. If you want to continue using Firefox with Smart View 11.1.2.5.710, do not upgrade your Firefox browser. If your Firefox browser is set to automatically install updates, Oracle recommends changing the setting to “Check for updates, but let me choose whether to install them.” See the Firefox help for instructions on changing this setting. 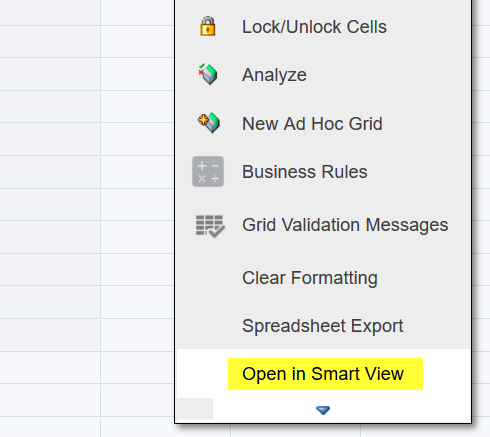 I have not heard any official statements yet, but I hope that Oracle will update the Smart View extension to work with the latest version soon. Meanwhile your best option is to use the less frequently updated Firefox ESR version as Oracle recommends. Financial Reporting Web Studio was introduced in the March 2016 update for PBCS and released as Patch Set Update .701 for EPM 11.1.2.4 two months later. Web Studio lacked some functionality at the time of the release but has almost reached parity with the Windows based Studio after recent updates. As announced in the December 2016 update for PBCS, the desktop client is going to be replaced by this web-based solution. The switch is tentatively planned to happen in the May 2017 update of the cloud service. The same schedule is also mentioned in the Statement of Direction document recently released on My Oracle Support. The readme file for FR Patch Set Update 11.1.2.4.704 informs users that support for the Studio desktop client will be discontinued in an update preliminary scheduled for mid-2017. How does this affect Hyperion administrators using FR Studio then? First of all, you can continue using the old client and Web Studio side by side until you feel comfortable moving to the new solution. But I recommend that all users of Oracle Cloud Services (PBCS or FCCS) and those running EPM 11.1.2.4 should start familiarizing themselves with Web Studio as soon as possible. Financial Reporting has always been very picky in the sense that the client and server components have to run identical versions and this means that an update to Cloud Services will render the desktop Studio useless immediately when Oracle stops releasing an updated client. The same version requirement also applies to on-premise installations but there you will have more control over when to apply the "Studio-killing" patch (supposedly to be released in mid-2017). You can choose not to install the patch right away but it's not likely that you can postpone it forever though. I assume that customers using EPM version 11.1.2.3 or older will not be affected by these changes as older releases have already fallen outside Oracle's error correction policies. It's still worth keeping in mind that Web Studio will be the only option when you choose to upgrade to a later release. Ok, Kscope16 went by and the conference was awesome. My summer holiday is also far gone and it was nice even though the weather could have been better (but hey, I live in Finland, not in Spain or Florida so some fluctuations are expected). After getting back to work in August I have been very busy helping a couple of customers who have gone live with their new HFM 11.1.2.4 environments or are in the process of doing so. But now it's time to update the blog again! I did a presentation about the new HFM Java API in Kscope16 and was glad to hear that many developers are already using it to achieve some cool things - like Ricardo and Rodrigo of DEVEPM.com with their ODI KM (how's the paper doing guys? ;). I decided to release my short "Getting Started" document to public to make it slightly easier for to people to pick up JDeveloper and get their first project built using the Java API. After getting the IDE ready you can start developing code for your Java program. In the next post I will concentrate on the coding part and show you examples of common tasks in HFM such as extracting data and running consolidations. If you have attended an Oracle EPM roadmap session lately you have most probably heard that unlike previous years a new EPM release is not scheduled for 2016. While waiting for the big 12c release to drop, new updates and features will be added to the current version in the form of Patch Set Updates. HFM PSU 11.1.2.4.200 was a prime example of this strategy and now Financial Reporting is the next product to get a feature-laden update. Financial Reporting PSU 11.1.2.4.701 was released today and it contains two big changes: FR Web Studio (a web-based report authoring tool) and an updated charting engine. I applied the PSU on my virtual machine running EPM 11.1.2.4 and took a peek at these new features. In this post I document the steps required to configure the Import Application feature introduced in HFM 11.1.2.4.200. I recommend reading my earlier post about the Patch Set Update if you haven't done that already. Note that the configuration is database vendor specific and I used MS SQL Server – if you need guidance for setting things up with an Oracle database you can see Larry Lapp's recent blog post about the same topic. 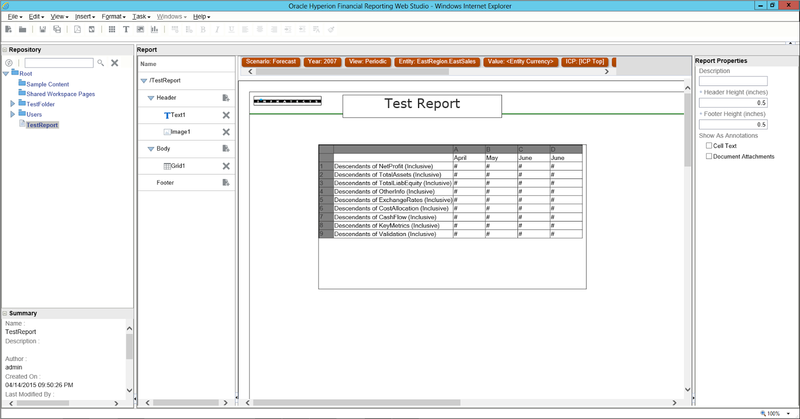 Oracle has released another big PSU to HFM 11.1.2.4. This one has been in the works for a long time so I was eager to test the update ASAP even though I'm still jet-lagged after returning from a two-week vacation in the Far East. Version number reads "Oracle Hyperion Financial Management, Fusion Edition - 11.1.2.4.200.5149"
Let's start with the most interesting bits. The list of new features included in the readme file is long but slightly misleading... Most of the "new" functions have already been included in PSU .100 and just listed again as this is a cumulative patch. Read on to find out what actually is new in this Patch Set Update.